Depending on all the nuances of your lighting and living situation, Noon will either be a game-changer or make no sense at all. Noon takes command of any lights you have on switches and whips them into shape. 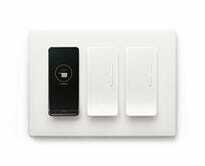 If it’s dimmable, Noon can probably dim it, but you’re still out of luck with any lights that are on remotes, and the system can’t dim Hue bulbs. If you’ve got a pretty standard system (and haven’t heavily invested in Hue already), it’s pretty easy to do some math and decide whether it makes more sense to replace your light switches (that won’t burn out eventually), or your bulbs. Of course, you’ll also be giving up the wild colors and app ecosystem that accompanies Hue in the process. If you’ve got a lot of non-standard lights, which is a first-world problem that accompanies things like new construction condos, Noon can be a lifesaver. Ironically though, just as Noon’s installer came and switched up my switches, I noticed Hue now offered GU10 bulbs (that are available on Subscribe & Save!). We’re hoping to test those soon. Noon’s switches are beautiful, especially the OLED screen on the “director” switch, and the “extension” switches have manual dimmers. That one director switch can handle ten extension switches, so again, it’s all about your setup. Lots of people will be fully covered by a single director. Noon is easy to control once you get all your lights and scenes in order, but can also be controlled via Alexa. The integration is great, but since we’ve gotten spoiled by thermostats with Alexa built in, and we saw standalone light switches with the same at CES, it would have been a great bonus if the director switch was a full Alexa device. If bathing your space in various non-white colors isn’t something you care about, Noon is an excellent alternative to Hue and its competitive set- elegant, responsive, and potentially cheaper.